You can privately rent the Integratron hourly (10:00am-7:00pm) or by the day (7 hours) for seminars, recording, retreats, and private events. You will have the Integratron and relaxing courtyard area to yourself for your rental period. Staff members will be on property during your rental to greet you, and assist you as needed during your rental. 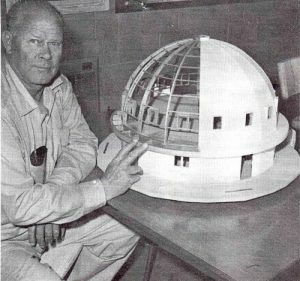 The Integratron is a 38’ high, 55’ diameter non-metallic dome that can host up to 35 people. There are 2 floors in the Integratron. The first floor contains archival information, photo library and reference library, surrounding a comfortable living room. The second floor of the building is the Sound Chamber. There are windows in every direction with sweeping views of the Giant Rock vortex and Goat Mountain. Mats, blankets and pillows are available for meditation, yoga or classes. The Integratron’s crystal bowls are not available for use, however renters may bring their own instruments/equipment to use in the space. For an additional fee, you can use the outdoor Cantina bar for food preparation and service, which includes the use of a small refrigerator and sink. Local catering services are available that include delicious meals, including vegetarian/vegan options. The Integratron no longer offers Overnight Rentals. 2 hour min., 4 hour max., 35 ppl max. 1-10 people $250 per hour. 11-20 people $400 per hour. $600/hr, for groups of 1-35. All hourly rentals over two hours are required to pay a cleaning fee of $80. A $250 fee will apply to your rental if you require our mats and crystal bowls to be moved, stacked and nested. The fees for total guest counts INCLUDE yourself and all staff necessary to run your event. Please Note: For any kind of recording, the hourly rates are DOUBLED. The Integratron is NOT a “sound-proof” recording studio. External sounds (i.e. passing motorists) are beyond our control. Day rental block is 7 hours; 10:00am earliest starting time, 7:00pm latest ending time. 35 ppl max. Please email for a quote. We will need to know the number of people you will bring, the equipment that you want to bring, and the specific activities you wish to hold in the space. A $250 fee will apply to your rental if you require our mats and crystal bowls to be moved, stacked and nested. Please Note: For any kind of recording, the daily rates are DOUBLED. The Integratron is NOT a “sound-proof” recording studio. External sounds (i.e. passing motorists) are beyond our control. Deposits are required to confirm and hold your reservation, which will be refunded if there is no damage upon your departure. Your deposit is refundable if you cancel 30 days or more prior to your reservation date, minus a $25 processing fee. To make a reservation, please send us an email. Let us know when you’d like to visit, how many people you plan to bring, and the nature of your visit (i.e. recording, retreat, healing arts). Please be specific and include a description of the type/amount of equipment you want to bring. All media inquiries, regardless of group size, will require a specialized quote. The Integratron is a NO alcohol property. No children under 16 unless special arrangements are made.